If you want to restore a listed building but you also want to incorporate modern acoustics, lighting and thermodynamics you’d call a good architect. But who is the architect going to call for help with the effects of, say, the annual sunpath or potential groundwater temperatures on the heating designs? Skelly & Couch, that’s who! 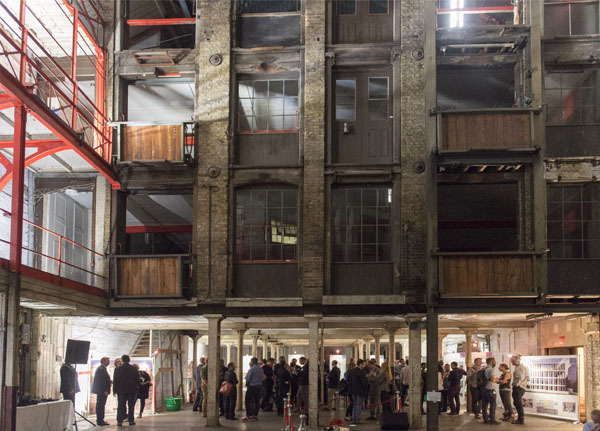 Skelly & Couch celebrated their work using a recent project as a venue: The Farmilow Building in Clerkenwell. Haven’t seen it? Well if you’ve seen any of the recent Batman films or Sherlock Holmes you will have already seen inside. It has been a popular filming location since the 150 year old glass and lead merchants George Farmiloe & Sons finally stopped using it as their base in 1999. A lot of celebrations are centred around people and their achievements but the guest of honour here was the building and I wanted to show it in context of the event. Standing far back and zooming in with the lens gives you a good sense of scale and the real size difference between objects (i.e. people versus a building). The large atrium gave me room to step back and see the exposed Victorian wrought-iron beams, panelled offices and hoists as well as the exhibition happening on the ground floor.